The third largest town in Derbyshire, Ilkeston is situated 9 miles from Derby and only 8 miles from Nottingham, belonging to the Erewash valley. Formerly a coal-mining town, it has managed to remain a thriving industrial centre. Ilkeston has a mention in the Domesday book, known then as Tilchestune. The history of the town is best described by a visit to the Erewash museum, along the High Street in a good example of Georgian architecture. Although the pits have all now closed the town still has strong industrial links with major Iron production works in the area, as well as textile and upholstery manufacture. There are weekly markets held in the town centre every Thursday and Saturday. 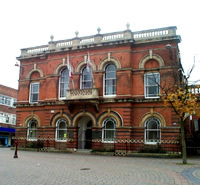 Some notable buildings worth a mention are the Town Hall of 1868, which is a baroque red brick building, and also St Mary’s Church of which certain parts date back to around 1200. The town offers all the usual shops bars and there is also a great range of sporting facilities in and around the town that includes a 10-pin bowling alley and an 18 hole golf course.